Lord Ashcroft’s latest marginals polling showed another mixed picture, with an average swing of 3.5% from CON to LAB, or a little over 3% if we exclude Crewe and Nantwich, which is likely to be showing the effects of its 2008 by-election. Other seats showed wide variation, with a 7% swing to Labour in Margaret Thatcher’s old patch of Finchley and a 3.5% swing to the Conservatives in Somerset North East. This mirrors the sort of picture we saw last week in Kingswood and Harrow, which could be a sign of a long-term shift towards the Tories in the West and towards Labour in London, or it could just be a coincidence. This was a pretty neutral batch – Labour will be happy to be ahead in some of these harder-to-win seats, while the Conservatives will take comfort from the fact that the average swing in these marginals remains smaller than the English average. YouGov/Sun showed an uptick for Labour. The vast majority of their fieldwork would have been done between the Labour and Conservative manifesto launches – tomorrow’s will be entirely after both, but it’s a fact of election campaigns that it’s often hard to determine what’s moving polls – there are simply too many “events” taking place. Tomorrow we get YouGov/Sun and maybe some other polls as well. 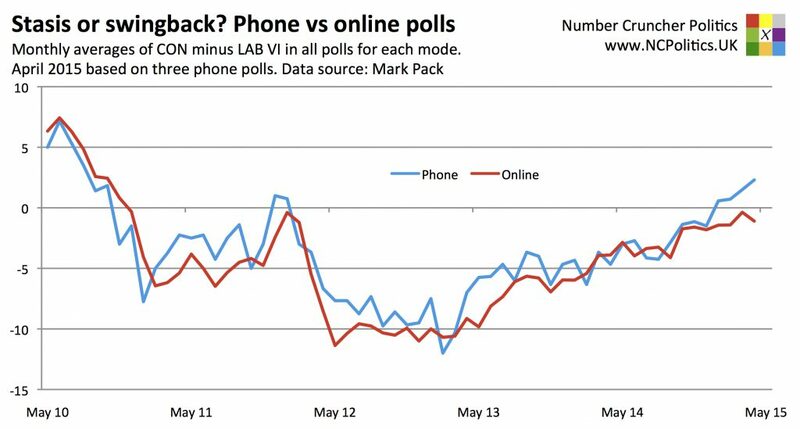 We’ve still had relatively few phone polls… We also get the Lib Dem and UKIP manifesto launches.